Tehran, 8 September 2005 (CHN) - Yesterday the historical village of Maymand received the 20,000 dollar Mercouri World Prize with a certificate presented by the Director-General of UNESCO to Ahmad Jalili, Permanent Delegate of Iran to UNESCO. The ceremony was attended by Petros Tatoulis, the Vice Minister of Culture of Greece, the Permanent Delegete to UNESCO of Greece, George Anastassopoulosi, and the Head of France's Sorbonne University. The historical village of Maymand in Kerman, south of Iran, was awarded the Melina Mercouri International Prize for the safeguarding and management of cultural landscapes (UNESCO Greece). The prize was awarded to the historical village of Maymand in recognition of its exceptional qualities as cultural landscape, a human settlement that has preserved a semi-nomadic agro-pastoral way of life over several millennia. The prize is meant to help support the Iranian Cultural Heritage and Tourism Organization in its work to preserve the village and the lifestyle of its 140 inhabitants. 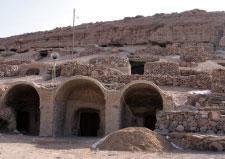 Maymand village, located between Shahr-e Babak and Maymand cities, used to be full of pistachio and wild almond trees. A lot of berry and black berry trees can also be seen not far from the village. Maymand plain is full of desert animals such as snakes, crocodiles, hedgehogs, and turtles. Besides in the mountains of Maymand there are different kinds of wild animals such as deer, leopard, wolf, fox, zebra, ibex and different kinds of birds. Many seasonal rivers, qanats (aqueducts), and springs can be seen in Maymand village and its suburbs, which have helped the region with a fruitful agriculture. Maymand consists of a set of houses that have been dug in the hearth of the mountain and the rocks which are called Hand-dug houses. "The houses which are used during the summer are called "Kapar" which are small wooden rooms with low ceilings. In these kapars, a stream of cold air is always flowing. Another architectural style which is called "Gonbeh" is a circled stoned wall houses with a wooden conical roof which has been covered by soil and mud. Inside the Gonbeh is warmer than Kapar," says Kiarash Eqtesadi, director of Maymand's research center. Sometimes the villagers of Maymand live in a kind of white tent called "Pollas", the vertical fibers of which are of cotton and the horizontal ones of goat's wool. The villagers are busy with animal breeding or fruit gardens during the summer. The rock houses of Maymand, some of which have been inhabited for as long as 3000 years, start at a height of 3 meters of Khorin Mountain and stretch to the flat plain of Khatoonabad. The knowledge of general public about the historical and picturesque villages of Iran was limited to Masuleh in Gilan province and Kandovan in East Azarbaijan. A lot of people had not even heard the name of Maymand village, until the four-year long researches and studies on the village. The US$20,000 prize, named after Greece's late cinema actress and Culture Minister Melina Mercouri, has been awarded every two years since 1999 to reward outstanding examples of action to safeguard and enhance the world's major cultural landscapes.